What Is A Good RPM or eCPM for My Website? What is a good RPM or eCPM for a website? One of the most common questions I see from digital publishers is, “what is a good RPM or eCPM for my website?” I completely understand this sentiment. RPMs (rate per mille) and eCPMs (effective cost per mille) are standard advertising metrics for how much an advertiser is paying for ad impressions on publisher’s page. The problem with this question is that it requires a lot more data to provide a really good answer. Below, I’ll highlight all the different things that need to be considered when determining what a good RPM or eCPM might be for your particular website or web page. I’ll also discuss why publishers should actually be focusing on a different metric instead when trying to ultimately maximize the value of the inventory on their website or web page long term. Scan digital publishing forums across the internet right now and you’ll find thousands of posts from users asking what a good RPM or good eCPM is for a “—” type of website. Everyone wants to compare themselves to another site like theirs to benchmark themselves against others. This is nearly impossible. I’ll show you why, and what you can focus on instead to ultimately get the answer you’re looking for. This is the one that almost every publisher understands. The topic, content you distribute, or niche information that you deliver to potential readers helps to establish part of the value of your website’s pages to advertisers. As a very rudimentary example, I own three websites. One of them is a website focusing on Brazilian Jiu-jitsu, another is focused on sports injuries, and the last one broadly focuses on health and wellness. My health and wellness website earns a much higher RPM and eCPM on most of its pages than the highest earning pages on my Brazilian jiu-jitsu website. The health and wellness site simply provides content to a much broader and more valuable audience. 2.) 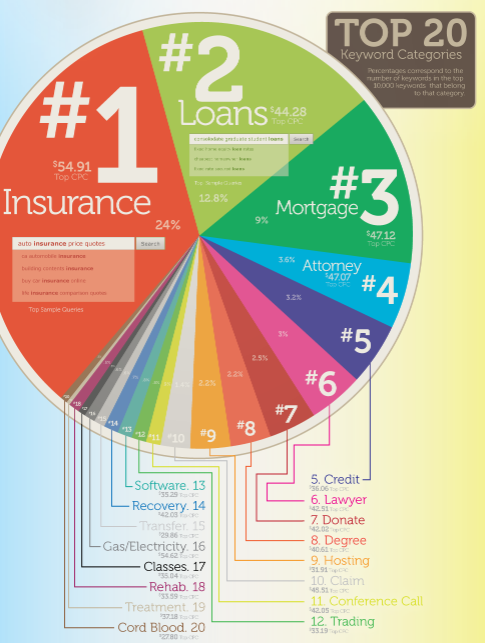 Who is visiting your website and its respective pages? This variable is often confused with a site’s content or niche. This is why the broad question of, “what’s a good RPM or eCPM for a Brazilain Jiu-Jitsu website?”, can’t really be answered without a lot more information. Your content, topic, and site niche can be the exact same as another website, but if you have two completely different audiences the RPMs and eCPMs will also vary quite a bit. This can be for the whole site or vary wildly from page to page, depending on what pages users are landing on (you can read more about why landing pages are more important to monitor than pages here). Why? Audiences play a big role in what advertisers are willing to bid for ad impressions or clicks. For example, a website featuring visitors from the U.S. and Canada coming to a website organically are likely worth more to advertisers than visitors coming to the site from certain parts of Africa via social media. 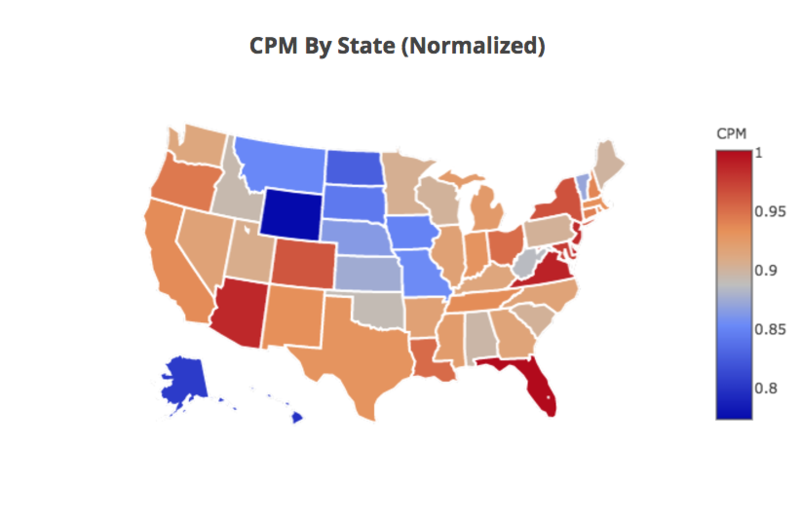 In these charts above, you can see global CPC’s from 2015 by country, and how a popular ad exchange prices CPMs by the state in 2017 (they even get as granular as pricing things by zip code). This is the reason why even sites with the exact same niche, types of content, etc. can have wildly different RPMs and eCPMs. It’s not an indictment on a site that may have a lower RPM, it may simply be the audience you’re attracting (which you can affect by looking at some of the global strategies here). Almost every website in existence experiences some degree of seasonality. For most, this is best displayed by seeing the rise in ad earnings or traffic experienced during the global holiday season from November through December. Above the typical spike in November and December (and inevitable drop in January), most publishers also see other trends in how their audiences and respective RPMs and eCPMs fluctuate on their web pages. For example, educational websites may see increases in RPMs during the school year and drops during scheduled breaks. Another example could be news sites that see spikes when current events — relating to their core subject — experience breaking news. These predictable and unpredictable changes all play a role in a website’s RPMs or eCPMs during a specific time period. So, let’s do the math really quick. Look at all the potential factors that could make it difficult for you to compare your site to another; as it relates to a good or bad RPM or eCPM. and that’s just the major stuff! All these factors together make it hard to create a standard good or bad RPM for a particular site in general. What’s more, even similar sites have a lot of caveats to deal with comparing RPMs and CPMs between them. 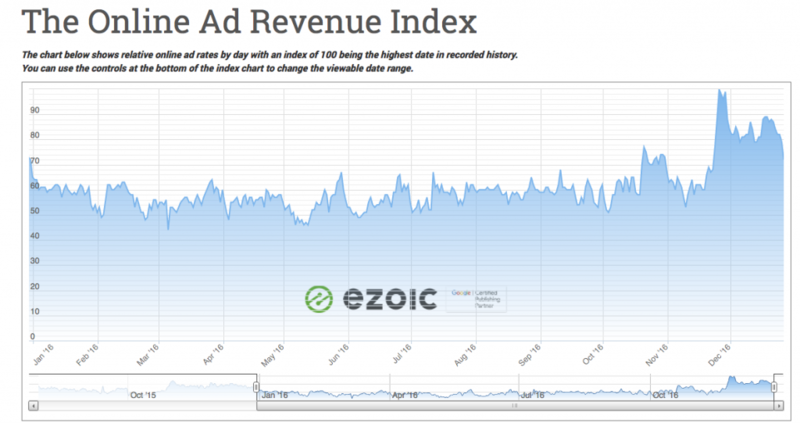 Am I making more or less digital revenue from my site than I should be? Taking into account all factors (seasonality, etc), how am I doing over time? Am I increasing my value per visitor or not? Answering those two questions above is really difficult when we are talking in terms of CPMs (see why here) or looking at RPMs and eCPMs as a core success metric (more info on this here). However, all is not lost. There are actually a few really good ways for publishers to empower themselves with data without much effort. What is session revenue (or EPMV)? This is a subject I have discussed a lot on the blog and my popular podcast, The Publisher Lab. EPMV (Earnings Per Thousand Visitors) is a metric that takes total earnings and simply divides it by a thousand sessions. This will allow publishers to account for total session revenue and the effect that things like bounce rate and pageviews per visit have on that number (as more pageviews and longer session duration correlate to more ad impressions and higher revenue). So… back to answering one of our original questions. Taking into account all factors (seasonality, etc), how am I doing over time? Am I increasing my value per visitor or not? Measuring and tracking EPMV on a site-wide basis and on a landing page basis can essentially answer this question more efficiently than any other metric. This will help publishers see the exact value of a user session and how it has progressed over time, and also ultimately discover which pages are triggering the highest value sessions. This is basically a way to compare yourself to yourself over time; while seeing through things like seasonality and traffic spikes. 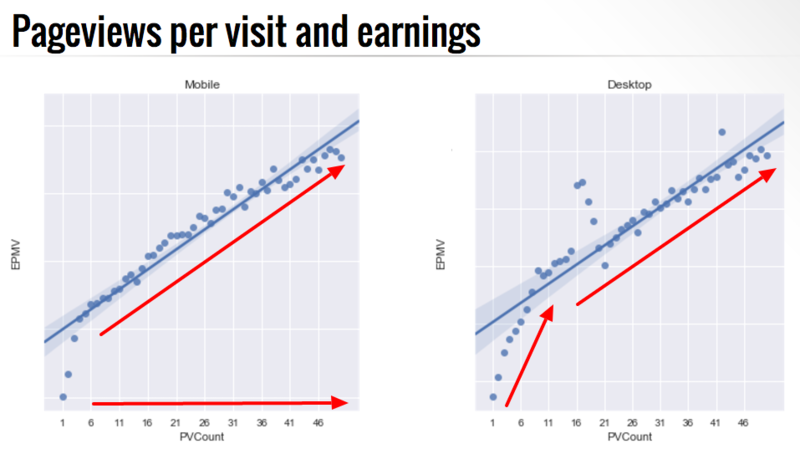 EPMV can tell you if you’re earning more or less from visitors over time, and automatically accounts for user experiences metrics that will likely affect the sustainability of your site’s earning potential in the future. Above, we mentioned all the reasons why you couldn’t really compare your site’s RPMs or eCPMs to other websites to get a “good” average. Fortunately, there is a way to sort of track how your site might be comparing on an EPMV level to over sites in an indexed format. 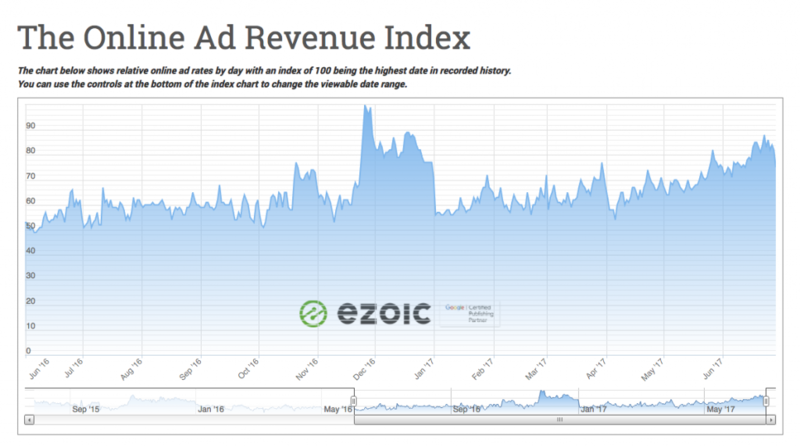 The Ad Revenue Index allows digital publishers to see the normalized website EPMV of thousands of sites in an indexed format. This may not give publishers the exact number they are probably looking for in this article, but it will allow you to compare your EPMV increases and decreases to other sites on the web to see if you are generally trending in the right or wrong way; compared to everyone else. I’m hoping that the information has you less concerned about a hard and fast number for a good RPM or eCPM. I bet there’s a part of you that still wishes you could just see a list of “—” sites and their respective RPMs. I can save you a lot of time and tell you that no such list exists. Additionally, I can reassure you that the information and techniques for measuring yourself listed above are far more valuable to you than any arbitrary number would. I talk to thousands of publishers every year and those growing the fastest are always thinking about their data in terms of the way I have outlined it above. Have additional questions or contributions to the subject? Leave them below. We have tens of thousands of publishers that read our blog each month. Perhaps they will chime in their thoughts as well. great. By this we can increase our revenue for more and more.